What’s a fair market price for will, anyway? If you enjoyed this bad philosophical dad joke, you might enjoy this one over at Daily Nous too! 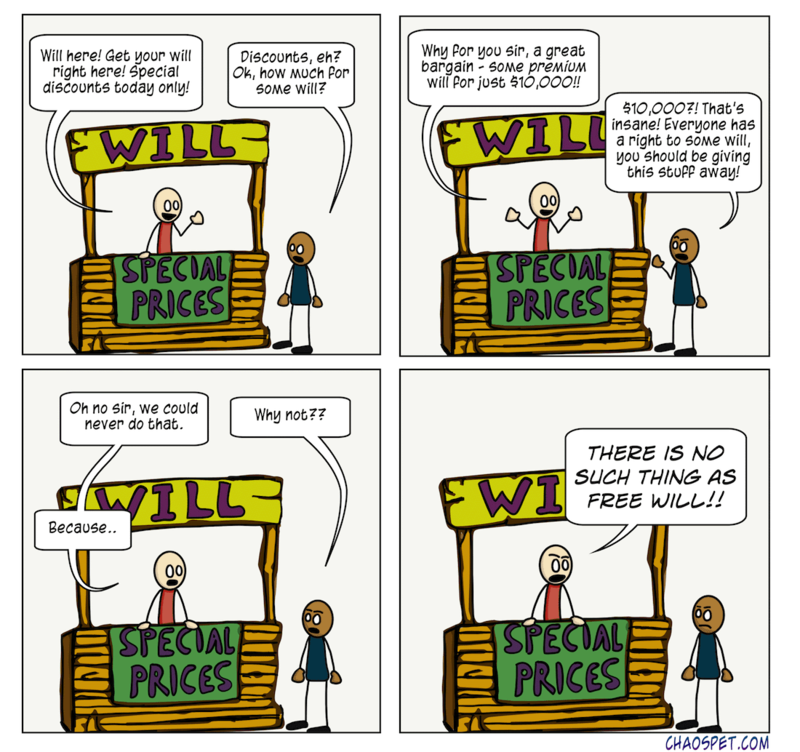 Interestingly, whether someone will buy the first will is not willful. Then suddenly the universe becomes non-deterministic once the first will is obtained. Also, I know this is a bad pun, but how does this person give people will? Does the shopkeeper have a will? How does the shopkeeper possess the ability to give people wills at his discretion? Why can’t I comment on old comics? Oh yeah, I just was leading up to that last question but I wanted to be generous and also comment something as well. and say that I don’t see why you are mocking the idea as it is actually kind of a good one. Why are quantum particles so “random” anyway? Also don’t give a sarcastic answer because I want your honest opinion so I can learn why it is such a bad idea. I closed commenting on the older comments because they had become magnets for spambots, so it wasn’t worth filtering through them for the very rare real comments. You did not state what you think of panpsychism, let alone what your position on panwillism was. Ahem, ahem, I’m not the one with the Phd. in philosophy, Mr. Lake. My take: Mr. Lake, I would like you to define, “murder”. This is a somewhat meaningless question until you define more precisely whether the existence of an action is contingent on quality and if so in what way, and if not in what way. The adverb “really” also has to be defined as otherwise this may or may not constitute a No True Scotsman fallacy. Finally, does the word “caught” mean to be connected with a negative event by an intelligence? Does the supposition have to be true to count? Does it have to be well-backed by evidence or is just opinion enough? You forgot the most important question – what is the meaning of the word “is”? More seriously, I don’t think the joke in that comic hinges on such a fine analysis of common words. And I don’t really like to spell out the meanings of the comics too much, I prefer to leave the interpretation as an exercise for the reader. But I do appreciate your enthusiasm for the comics. Mr. Lake, you are a genius. I knew something was wrong with me commenting enthusiastically, but I didn’t know why. Now I know exactly why such questions are not asked; this is a webcomic and the interpretation is left up to the reader. Thus, these are “commenting” pages and not “questioning” pages. It makes perfect sense now. On a different note, maybe you should write that. Also I am known for being long-winded by my friends. Also, because of the nature of philosophy I could ask questions on every comic, which would either be silly or a quest so bold I didn’t even feel like it so I just chose a random comic. Also, I have always been enthusiastic behind the scenes, but I didn’t feel like commenting. To be honest, I don’t have a well-worked out view on panwillism, beyond what I said earlier (that I think it’s about as plausible as panpsychism). Panwillism was a silly term that I made up for the purposes of a comic, but as was mentioned in the comments on that comic, there is no philosophical view so silly that someone hasn’t defended it.